Those looking to break free from the been-there-done-that doldrums of theatre have much to smile about in the Soulpepper Theatre Company staging of Cage where Zen Buddhism, space and memory are drawn together to blow your mind. NYC audiences are in for a big treat this summer when the production heads to The Big Apple. Witnessing acting icon Diego Matamoros display characteristics of a primate within the confines of four transparent walls is about as anti-evolutionary as it gets. Yet this represents a fantastical leap forward for live performance in our city, not a journey into the past. What a creation for Soulpepper Theatre to sign on with given its origins with the classics. Cage is to playgoers what U2’s Zooropa was to music lovers—unexpected, daring and so refreshingly needed. You get the sense that this is some sort of parallel universe within the opening moments when you can’t just hear a pin drop, you can almost hear a pin dropping. Flickering fluorescents lead up to Diego Matamoros’ declaration, “Let’s start where language ends.” Transcending experimentalism then begins to shapeshift with some of the most peculiar visuals imaginable. And when you see 100s of ping pong balls go bouncing by your feet, you may begin to ask what kind of hallucinogens the Albert Schultz’ innovators have been dabbling with in breathing life into this stupendously artsy presentation. It’s rare for a show to be so satisfying by saying so little. 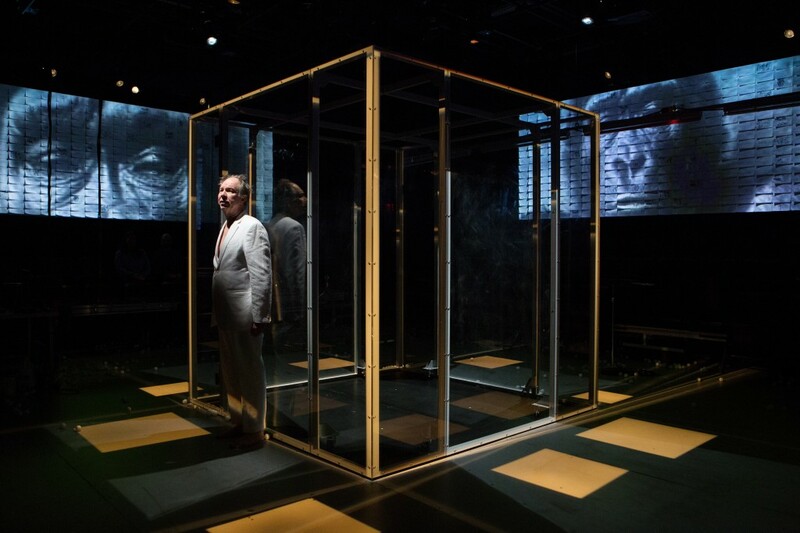 Instead a trajectory of meaning—accented by four screens and a Plexiglas cube—seizes the senses and off into the ether you go. ‘The body is a cage, the mind is a door,’ stipulates the explorative performer midway through the piece. This one’s definitely not for the imagination deprived. But even a chattering monkey inside your head can attest to that.